The verdict is in: Hotel loyalty rates are paying off – at least for some of the largest chains with robust loyalty programs. It's been roughly two years since many U.S. chains started offering lower rates to loyalty members, circumventing rate parity rules with OTAs. 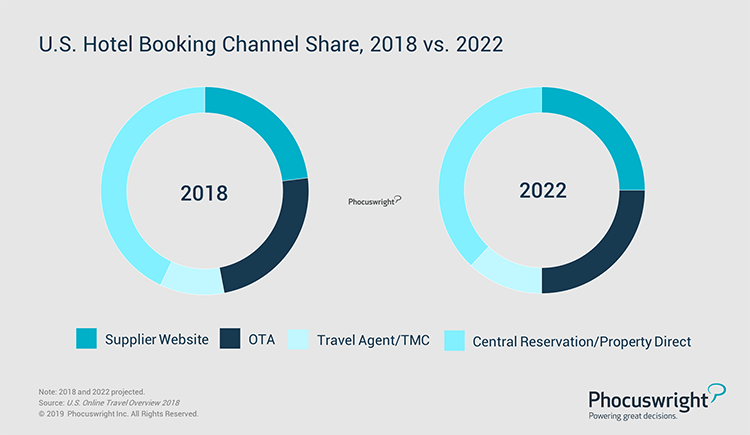 According to a new Phocuswright travel research report, U.S. Hotel & Lodging 2018: Key Developments, hotels are now catching up to OTAs in terms of online distribution. Meanwhile, after years of double-digit growth in OTA sales, gains will fall to single digits in 2019 and beyond. Of course, discounted member rates come at a price. Hotels must balance the benefits of selling more rooms direct and attracting new members with the resulting deduction in Average Daily Rate (ADR). So far, the major chains are denying a revenue hit. Regardless of the impact on hotel profits, it's clear that more and more travelers are savvy to loyalty discounts. As hotels continue to promote their lower rates, this practice could take a bite out of OTA chain hotel sales for the foreseeable future. Phocuswright's U.S. Hotel & Lodging 2018: Key Developments explores the most notable trends and stories impacting the U.S. accommodations segment. For additional analysis and data, also see: U.S. Hotel & Lodging 2018: Market Sizing and Landscape.